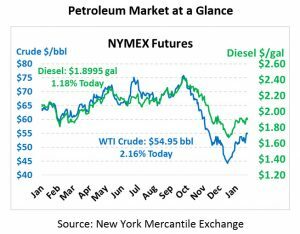 Prices yesterday set their aims high, with crude prices soaring above $55, but the momentum didn’t stick. Price tumbled, resulting in a small loss of roughly 45 cents. Today, crude oil has recouped yesterday’s losses and is moving higher once again. Crude prices are $54.95 this afternoon, up $1.16 (2.2%). Fuel prices also saw early-day gains turn to losses, resulting in roughly 2 cent losses for both products. 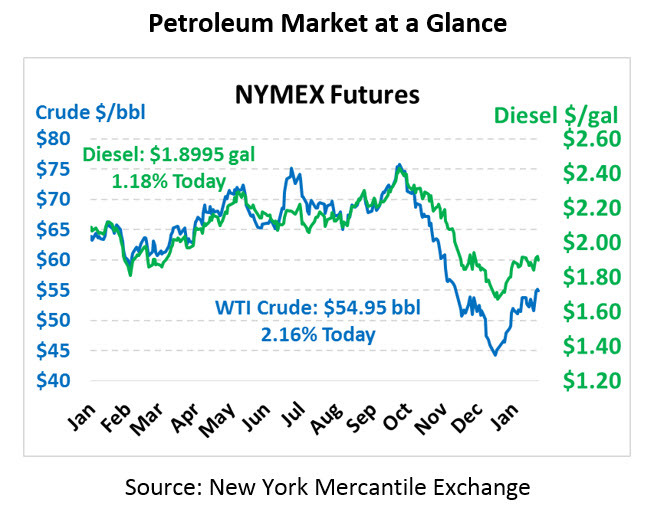 Today, products are trading higher, with gasoline leading the way. Gasoline prices are currently trading at $1.4246, up 4.7 cents (3.4%). Diesel prices are $1.8995, up 2.2 cents (1.2%) since yesterday’s close. Prices are rising this morning in sympathy with equity markets, both responding to positive job reports released this morning. Despite the government shutdown, job growth had a strong showing, with the US picking up 304,000 jobs in January. With the US economy running strong, the question is whether the global economy will see comparable strength. China recently published that 2018 brought near 30-year lows in GDP growth. US-China trade talks are seen as the lynchpin for the global economy – if tariffs are not lifted, global growth could be stifled significantly, causing oil prices to fall. Yesterday the EIA reported that November 2018 US crude production averaged 11.9 MMbpd, sending prices falling from two-month highs. Previous reports had placed the average at just 11.7 MMbpd, so the revision showed that there’s even more supply available than previously thought. In addition, rumors began circulating that refiners are cutting their utilization rates due to gasoline prices being too low, which is contributing to a strong boost in gasoline prices this morning.